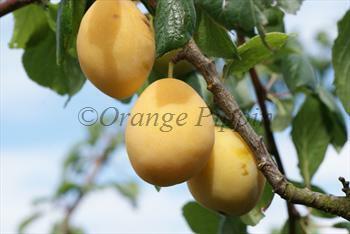 Yellow Pershore is an attractive traditional cooking plum from the Vale of Evesham in the West Midlands. It was rated by the Victorian fruit expert Robert Hogg as "an excellent baking and preserving plum" and is excellent variety for plum jam. It can be eaten fresh when fully ripe, but this is a plum which excels for culinary use - and for the best culinary flavour the plums should be picked before they are fully yellow. If you want an easy to grow and productive cooking plum as an alternative to Victoria, Yellow Pershore is a good choice. Please fill in the details below and we will let you know when Yellow Pershore plum trees are back in stock. Yellow Pershore is in flowering group 4. Yellow Pershore is self-fertile and does not need a pollination partner, although fruiting may be improved if there is a compatible tree of a different variety nearby. Yellow Pershore is a very easy variety to grow in the garden, and has the advantage of being self-fertile. The only real problem is that it in a good spring Yellow Pershore can occasionally set too large a crop, which can cause branches to break under the weight later in the summer. The solution is to thin the fruitlets when the blossom has finished, although it has to be said that thinning plum fruitlets is a very tedious job. Yellow Pershore also has excellent natural resistance to the main plum diseases silverleaf and canker. Cropping is reliable and heavy, and it is suitable for most parts of the UK. Young Pershore plum trees can also be used as rootstocks for some other plum varieties. A traditional variety, discovered in the Vale of Evesham, Worcestershire in the early 19th century. Widely known as Yellow Egg (on account of its shape) or just Pershore. It has been grown commercially in the Vale of Evesham since Victorian times.